On May 14th at Swope Park Disc Golf Course in Kansas City, Mo an extraordinary event occurred. 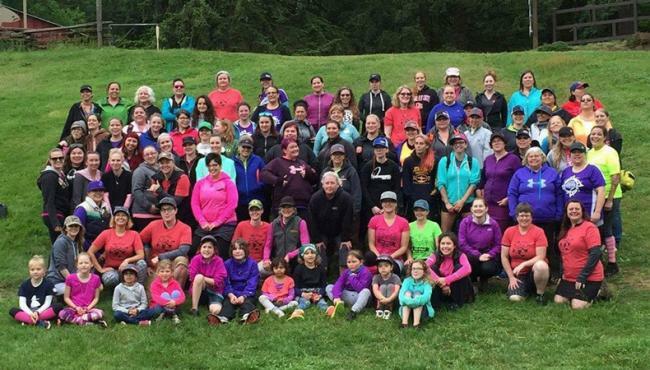 89 ladies from 8 different states, from ages 7 – 60, shared a disc golf experience like no other here in the Midwest. 81 of the 89 actually competed, and for many it was their very first tournament experience. Thank you to Melissa Petrin for her hard work filming and doing interviews to help capture the event. She was also was responsible for getting us covered in the local media. Check out the video that aired on Time Warner MetroSports Channel. This has been a dream come true for myself and my assistant director, Amy Crowe. Just seeing that many women competing and having a great time together brought a few tears throughout the day. Our mission with the Kansas City Disc Golf Divas has always been to grow the sport for women. We started doing this locally with our leagues and other activities. Now with this event, we have a greater reach and can share the sport with women in the entire Midwest. More women playing disc golf and more friendships made that we hope are for a lifetime. This year we were also a part of the 3rd biennial PDGA Women’s Global Event (WGE) and over 1600 other women across 11 countries and 28 states also competed simultaneously in events like ours! Collectively, this created the largest PDGA sanctioned event for a single demographic ever. With WGE events held in the United States, Canada, Finland, Sweden, Norway, Australia, Estonia, Iceland, United Kingdom, Germany, and Japan, the WGE reached more new countries and countless new players from around the world. Thanks and big hugs to Valarie Jenkins, Sara Nicholson and the entire WGE planning team for their hard work and dedication to making this such an amazing event. Read more about this international success story here! Thank you once again to all our fabulous sponsors of the KC Diva Spring Feeva! Be sure to check out our final sponsor page here with a list of their businesses and websites. Please be sure to thank them for helping us bring this event to Kansas City. Thank you to our friends and volunteers for their assistance, encouragement, tips, and overall support that contributed to the success of this event. The course was BEAUTIFUL thanks to Patrick Smith, Gary Birge and everyone else that played a part in setting up the Diva Feeva layout. Special thanks and gratitude goes to Amy Crowe! She has put in countless hours of work helping organize the event. She is a tremendous asset to our team and a great friend. I could not have done this with out her. Last but not least I thank my husband, Ben Crosby, who has supported me all these years with my mission to promote women’s disc golf. I can’t imagine having another Tournament Director for this event.